East Village Association | West Town Chicago: East Village liquor moratorium: Last call? East Village liquor moratorium: Last call? Join the discussion about liquor moratoria at the May 7 East Village Association meeting. Liquor has been on the minds of many East Village residents, and not just since St. Patrick’s Day. Conversations are effervescing in front yards, in sidewalk cafes, on Facebook and through email about the pros and cons of new liquor establishments in East Village. It’s no wonder, in recent months, that EVA has been asked to consider lifting liquor moratoria in four different locations, and has addressed other contentious liquor issues. A generation ago, the residents of East Village set out to address the problem caused by alcohol sales. The issues had changed very little since the 1950s, when Division Street bar fights were the backdrop to Nelson Algren’s writing, and problems went beyond loitering, noise or litter. Police saw liquor sales contributing to drug crimes, robberies and prostitution, And real estate agents had good reason to believe liquor establishments were crowding out other businesses and adding to safety concerns of home buyers. Community concerns led the City Council to place two kinds of liquor licenses on hold. A moratorium on "packaged goods" prohibits new liquor stores (green on map), and a "consumption on premises" moratorium bans new taverns (red on map). Newer residents may be unaware a moratorium is in place: Either type keeps existing licenses in place, with no restrictions on "incidental" liquor sales in restaurants. The moratoria typically run in two-block increments, and cover both sides of the street, unless specifically designated otherwise. 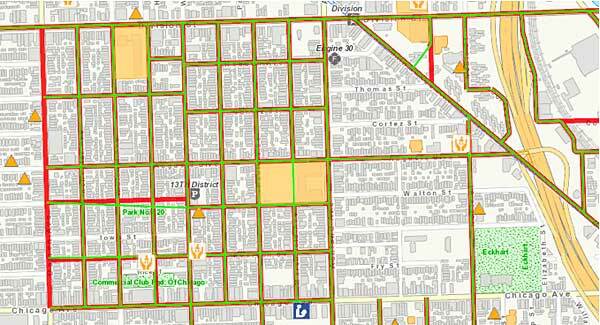 Virtually all East Village streets west of Ashland have both types of restrictions. The one exception is now Damen Avenue, where Ald. Proco Joe Moreno recently lifted the packaged-goods moratorium, against the protests of the East Village Association, to allow liquor sales at a convenience store. Although the store went out of business before obtaining a liquor license, the moratorium cannot be restored for one year, leaving the rest of Damen vulnerable to new packaged goods establishments. The moratoria have served East Village well. The last decade saw the transformation of our neighborhood into one of the city’s most desirable areas to live and a destination for dining and entertainment. Restaurants and sports bars have thrived under the moratoria, while demand for the liquor establishments of Algren’s days has declined. The few old style liquor-store-taverns that have survived are the exceptions that prove the rule, and continue to be anachronistic blights on the community. With new community demographics and an improving economy, today the East Village Association is being showered with requests to lift individual moratoria to accommodate alcohol sales. These are coming from a variety of businesses, ranging from an established restaurant that wants to create a wine & cheese shop, and an organic grocer that wants to sell wine, to a new national chain with a business model dependent on alcohol, and a convenience store that promises it will transform into a green grocer, but only after it is allowed to sell liquor. Taken at face value, it is relatively easy to distinguish between these four businesses. Anyone who has removed empty bottles from their parkway understands at which end of this spectrum the problem lies. Unfortunately, Chicago's liquor licensing system makes no distinction between Chateuneuf du Pape and Mad Dog 20/20; a packaged goods license allows the retailer to sell anything. There is no such thing as a Chicago “beer and wine license” as is common in the suburbs. Certainly the neighborhood has changed. The law has not. There have been attempts to impose restrictions using covenants between the retailer and the alderman, but they are difficult to monitor and hard to enforce. Moreno has said that CVS operates under such restrictions, yet it was recently was selling products prohibited under the covenant. This was documented only because of the vigilance of a neighbor, and there is no indication that there were any legal ramifications. If a highly visible corporation like CVS can’t, or won't, abide by these agreements when everyone is watching, what hope is there? Even when covenants are successful, they are a blunt instrument. They typically restrict the sale of those forms of alcohol that are most often abused: airline bottles and fifths in the case of hard liquor; 40 ounce and larger containers for beer. But the devil is in the details; it is common for craft distilleries to sell small bottles of liquor and for local breweries to sell growlers of beer; these would also be prohibited. The result? Instead of independent green grocers and wine & cheese shops, we get “convenience stores” that sell bland, national brand beers, wines and liquor that comply with size restrictions, but with price points that still result in abuse. EVA has a long-established, consistent and fair process for evaluating requests like these. But all this effort to ensure there won’t be a negative impact on the neighborhood obscures another problem: To grant an individual business request, the entire moratorium must be lifted, meaning in most cases two blocks, both sides of the street. are open to new license applications. Regardless of how careful we scrutinize the first business, once the moratorium is lifted, subsequent businesses are free to apply for liquor licenses and operate as they see fit. And once those licenses are issued, they are essentially immortal. Although in theory a license can be withdrawn for adverse impact, the process favors the liquor licensee, puts the burden on the community and takes a very long time to run its course. A bad business generating revenue from a liquor license will always have both the motivation and the resources to fight hard. They can tie up the city’s enforcement process for years. How can an all-volunteer organization like the East Village Association stand up to that? Without an assertive way for either the city or community to weed out bad bars, community groups must treat every applicant as a potential risk. Or they must trust that the city will acquire ample police or legal resources to address both current and new threats. Community groups have only an advisory role in granting, prohibiting or restricting liquor licenses. But with some moratoria lifted and others under review, it’s up to the community to voice its concerns and hold our representatives in city government to account. EVA can put forward nuanced solutions to the city’s liquor-control issues. After all, it meets in a tavern. Come to the next EVA meeting at 7 pm May 7 at the Happy Village, 1059 N. Wolcott, for a conversation with your neighbors about the liquor moratoria that protect our community.